But this weekend, I decided to tackle my fears and take a crack at upgrading my childhood ham and cheese sandwich nightmare. 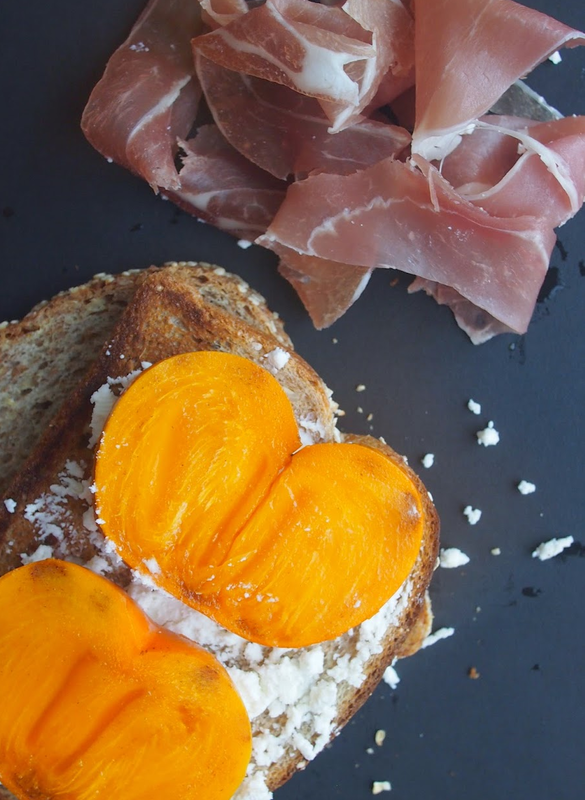 Ladies and gentlemen, may I introduce you to... the persimmons, prosciutto, crumbly goat cheese sandwich! I like to think of it as the winter's version of an apple and brie sandwich. The same salty ooze, the same delicious sweet crunch. But the persimmon gives it that extra juice, almost like a ripe melon or a peach, that you just don't find in an apple. So the next time you're feeling adventurous with your sandwich, why not give it a try! 1. Toast two slices of multigrain bread. 2. Spread goat cheese on one of the toast. 3. Add slices of persimmons. 4. Fold layers of proscuitto over. 5. Top with the last slice of toast. Face, meet toast. Toast, face.